Goal: To fully connect in order to bring in representations of the Self and Soul for healing insight and knowledge. 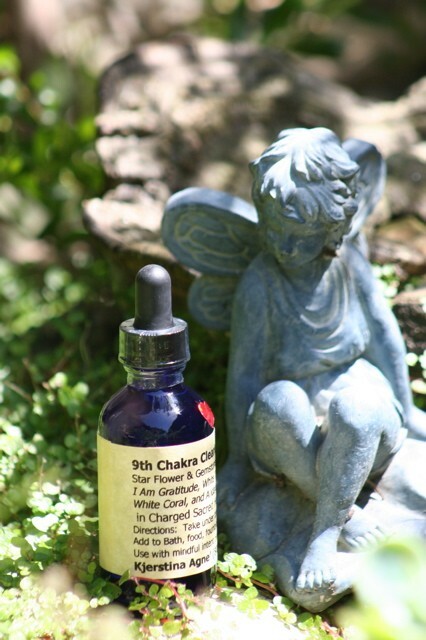 From 9th Chakra, we can gain knowledge, life purposes and tasks,destiny points, significant relationships, power symbols & the purpose for healing. Clear Quartz - Can be used to amplify and to facilitate both speaking with and receiving info from spiritual and other-worldly masters, teachers and healers. Used extensively in meditation, spiritual development and healing. 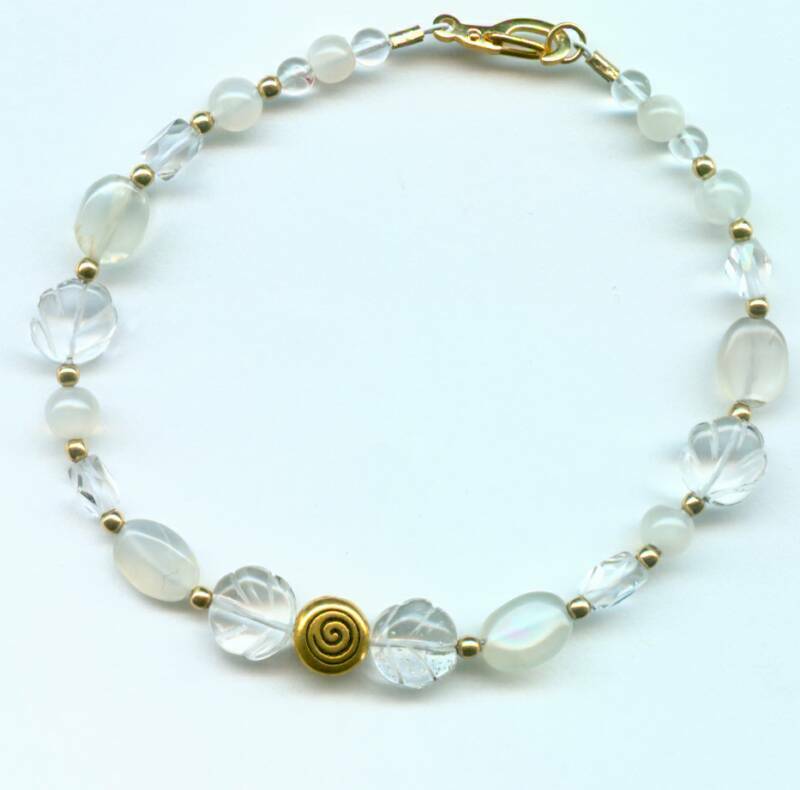 Moonstone: Balancing, introspective, reflective. Helps one to recognize ups and downs and gracefully acknowledge changing cycles. Stimulates intuitive recognition, enhances perception & discernment. Cleanses negativity from chakras, enhancing feminine aspects of ones nature while providing for spiritual nourishment & sustenance and loving compassion to assist one through all changes. these drops. Gratitude ignites hidden sources of energy and light, lifting you to new levels of joy and peace. A Grateful Heart is the most powerful force in the Universe. Tap into the source of universal energy. The etheric body is rejuvenated and aligned with the physical body. White topaz feeds the light body. Travel to other realms. It is a source of strength and great to use on the meridians. Kuan Yin infused her energy into this magnificent topaz essence. Conscious connection and manifestation of wisdom; turn vision into realities. White topaz is also about the reversal of aging. Body: Helps select appropriate Sperm and Egg for this lifetime and oversees the physical and emotional patterns we came to experience. Young Living Essential Oils:: Magnifying Your Purpose on the bottoms of feet and on crown chakra. Place Harmony or Motivation about one arm's length below feet in the auric field. The ninth chakra contains our soul's genes, the programs underlying the choices we have made regarding our physical bodies, or emoitonal states, and our mental beliefs. The ninth chakra is referred to as the "Seat of the Soul." As we fully connect to the ninth chakra, it brings in representations of the self and sould for healing insight and knowledge. We can gain knowledge, life purposes and life tasks, destiny points, significant relationships, and power symbols, the purpose for healing, all from this center. The ninth chakra is a mushroom shape, and is masculine in appearance, with a feminine overlay. It communicates through images, archetypes, patterns, numbers, and other symbols. Each symbol functions like a chromosome and contains archetypes to a particular person. All symbols refer to our basic belief about self. This chakra contains the yang ability to imprint and design the physical body and to mold a life for meeting the soul's purpose. The yin ability to bring in energy from source to create and change the soul itself. The etheric body is the energy growth template for the physical. Energetic changes occur at the etherical level before manifesting as a physical cellular event. The Ninth Chakra contains the energy of change and creation. It contains the blueprint or the master plan for this lifetime. The spiritual body may now completely enter physical form. During this period we are challenged to open up completely to our spiritual purpose, so we may begin our life work. This period often begins with or is accompanied by major life changes, divorce, changes in career and giving birth to a child. These changes happen because the opening of this chakra brings the potential knowledge of our true self. The patterns we came to work on from the soul level will continue to be repeated to learn the lesson over again until healing the soul body or the pattern. Family programs may rerun again and again for a second look. All who are willing to experience the feeling that inhibit true expression of our higher purpose and address the beliefs that do not reveal the true self, the ability to make life changes necessary to move forward will receive knowledge from this chakra. This chakra is directly related to the function of the Tenth chakra that holds the most painful things we came to experience, the physical characteristics, spiritual blocks, emotional patterns and mental perceptions and processes that assist us in experiencing what we came here to learn and heal. The Second Chakra is about our awareness of feelings and our right to express and create them, our development of our feelings and our choosing to feel or choosing to numb out. Full development of the second chakra allows us to trust ourselves and our feelings to be creative and express. The Ninth Auric Level: This auric level occupies a very small almost nonexistent space on the physical plane and directly relates to the ninth chakra. The ninth level doesn't occupy much space; it operates under the laws of limitlessness and abundance and my motivate energy to move beyond the speed of light. The location is just above the ninth chakra and is about the size of a pinprick. Unlike the other auric levels this one does not surround the entire body. This small portal assists us to connect with the essence of our soul and of its source. While experiencing this level you can pursue new ideas to solve problems or to heal existing patterns. This aspect of ourselves is peaceful, contains enlightenment and bliss. This auric level has a tremendous impact on simple removal of old patterns and creating new. Guided imagery and meditation to journey here often will create change quickly. This point is significant in the ability to create change quickly because there are no limitations where it exists and the ninth auric level doe snot take up space in the physical plane, therefore not being affected by how the mind and body has recorded it. Selenite (Translucent white/clear) Expand awareness of your surroundings o Access possible future lives. Provides energy to promote justice during disputes. Gives strength to decisions. Use directly on the spinal column for alignment and flexibility with muscular structure. Lifespan extension. Advancement of mental powers. Clear, telepathic communication with like-minded people. White Coral Opens and clears the crown chakra. Brings a sense of purity, health and wholeness. Brings forth the information needed to assist humanity. Protects the powerhouse within. Andara (Root Beer Brown ) o Trust o Working through the Heart Greatly accelerate growth process. RBBA is also called Indian Pearl and known as Shaman Stone/Peace Keepers are known for transforming disharmony. Also very grounding and can help with sleep and digestive disorders. Flighty, spacy people would benefit from this essence.